Jaguar really didn’t do much for itself as a sporting marque between the years of about 1955 and 1980. Sure, some of their cars competed in the hands of privateers over the years, but a factory effort was missing. That changed when Bob Tullius’ Group 44 race team was staring down a shut down. Jaguar came calling and essentially absorbed the race team to be their factory effort in the prototype arena. The goal was to compete in IMSA GTP and the FIA World Endurance Championship (and later, Le Mans). It’s very aerodynamic and uses an aluminium tub, Kevlar composite body panels and Lockheed disc brakes. The engine is a mid/rear-mounted 6.0-liter V-12 making 625 horsepower. If geared correctly, this thing can do 217 mph. Bob Tullius owned this car after its brief racing career ended and he drove it at the 2000 Goodwood Festival of Speed. It was acquired directly from him by its current owner. It has been recently restored and track-tested. This is a historically significant race car: it was the first XJR prototype and it spawned a series of successful prototypes (and even a sports car) that were competitive for the next 11 years. One of these last sold in 2006 for less than $250,000. Things may have changed little since then. We’ll see. Click here for more info and here for more from this sale. Update: Failed to sell (high bid of $475,000). 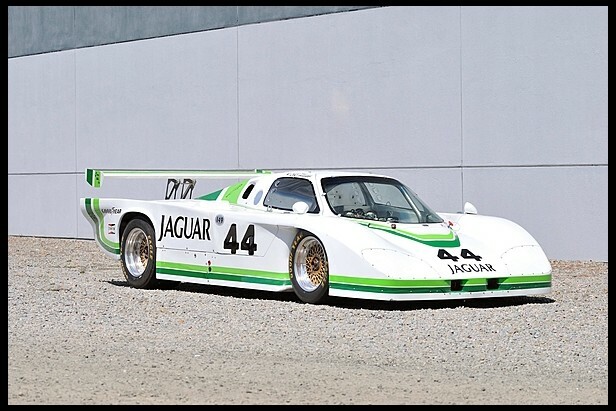 This entry was posted in Uncategorized and tagged 1982, auctions, cars, classic cars, jaguar, mecum, race car, race cars, xjr-5 by classiccarweekly. Bookmark the permalink.